A tasty treat for summertime entertaining! A lifelong fan of iced tea, I didn’t know what to expect the first time I tasted a ‘spiked’ version. I was pleasantly surprised to discover the tea and lemon flavours still predominated and found the drink to be quite refreshing. 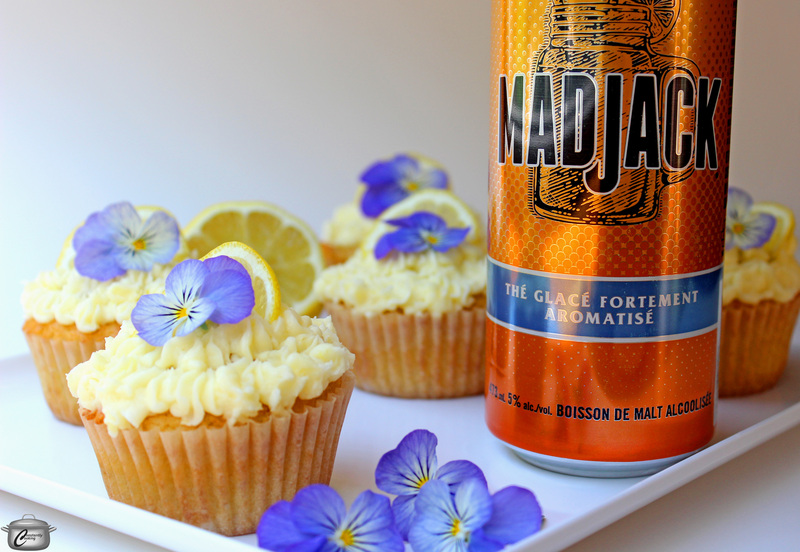 A recent offer to try a new-to-me version called MadJack Hard Flavoured Iced Tea got me to thinking about how alcohol can really perk up the flavour of some baked goods….and so, this cupcake recipe was born. 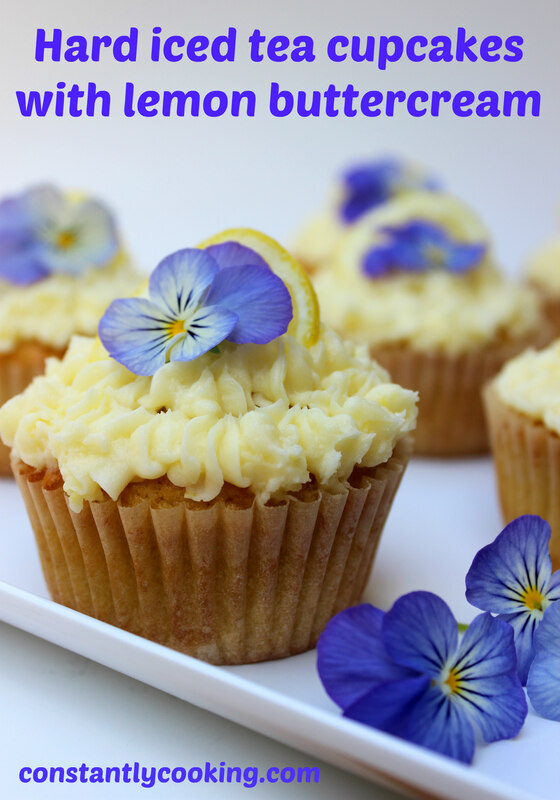 The malt beverage’s unique flavour shines through in a subtle but pleasing way in the cupcakes and the lemon buttercream icing also gets a boost from MadJack. I’m so happy with the way these turned out, I’ll likely repeat the experiment with some of their other products – the Apple Lager in particular sounds quite intriguing! Make cupcakes by preheating oven to 350F. Line 12 compartments of a muffin tin with paper liners and set aside. Beat sugar, butter and lemon zest together for 2 minutes until light and creamy. Add eggs one at a time, beating after each addition. Combine flour, baking powder and salt. Add to butter mixture in two parts, alternating with hard iced tea. Fill lined muffin cups with batter and bake for 18 – 20 minutes, until tester comes out clean. Make buttercream by beating together butter and lemon zest on medium speed until fluffy. Add hard iced tea and lemon juice, then beat until well-incorporated. Add the icing sugar, 1/2 cup (125 mL) at a time, and beat until smooth before adding next amount. Check consistency and add a bit more icing sugar or lemon juice as needed until it is the right consistency for spreading (a little thicker) or piping (a little thinner). 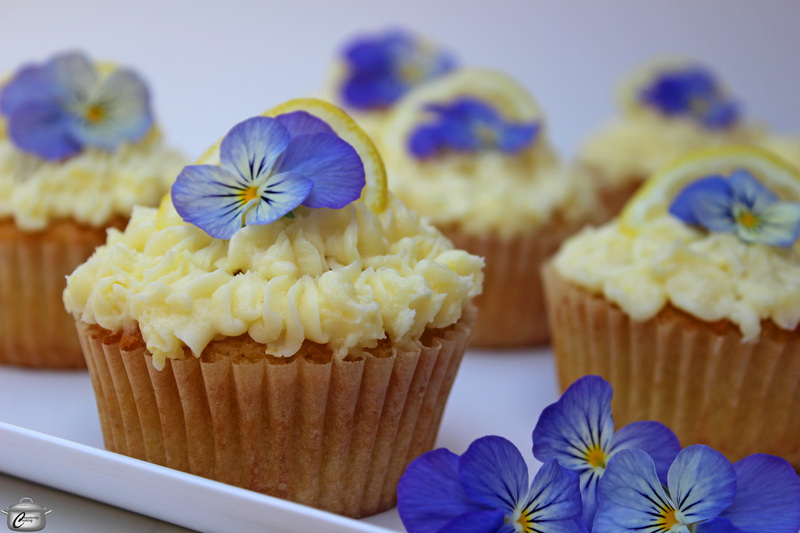 Spread or pipe a generous amount of buttercream onto each cupcake and garnish as desired. Disclosure: I was given sample products from MadJack to develop this recipe. Opinions expressed are, as always, entirely my own. This entry was posted in baking and tagged bridal shower dessert, cupcakes, dessert for a party, entertaining, hard iced tea, lemon, MadJack, malt beverage, Paula Roy, small batch cupcakes, spiked ice tea, stag party dessert, summer, summertime, summery desserts, using alcohol in baking. Bookmark the permalink.